Papyutto’s Twinstant Mobile at a pet show. 1. Tell me about Papyutto. Where are you located? Who is your target market? SHOHEI: Our location is in Japan, my target market is pet and children’s growth memorials and records. 2. What’s the most popular product you sell? SHOHEI: The 5-inch 3D printed figurine. 3. What do you like about the Twinstant over other 3D scanning solutions in the market? 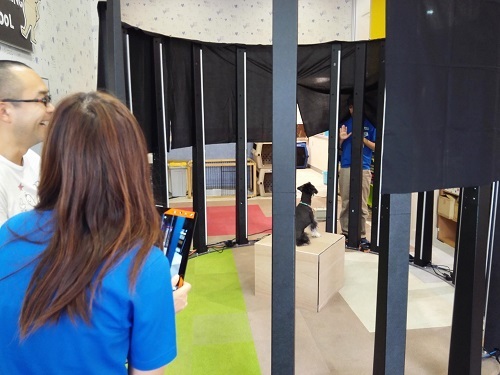 SHOHEI: My favorite things about the Twinstant Mobile are its easy operation, mobility and competitive price relative to other full body 3D scanners on the market. 4. What events have you found work best? SHOHEI: So far events based around pets have performed quite well. 5. If you could tell people new to the 3D printed figurine industry one thing, what would it be? SHOHEI: As current full color 3D printers get better, the quality of the 3D printed figurines will rise, making the product more and more mass market. Right now the bottleneck for higher quality 3D printed figurines is the 3D printing technology. Curious how to take a full body 3D scanner to an event?